I found something wonderful today. I’ve passed People’s Rx maybe 500 times. It is footsteps from my apartment complex and has always had that “locals only” vibe to it, but for some reason I never ventured inside. I normally walk past the place with my dog, watch people come in and out with white-paper wrapped packages and then use my “Damn, I have the dog with me” excuse (not an excuse in Austin, by the way) to not go in. Well. I went in today. I was wonderfully, beautifully, spectacularly surprised at what I found. 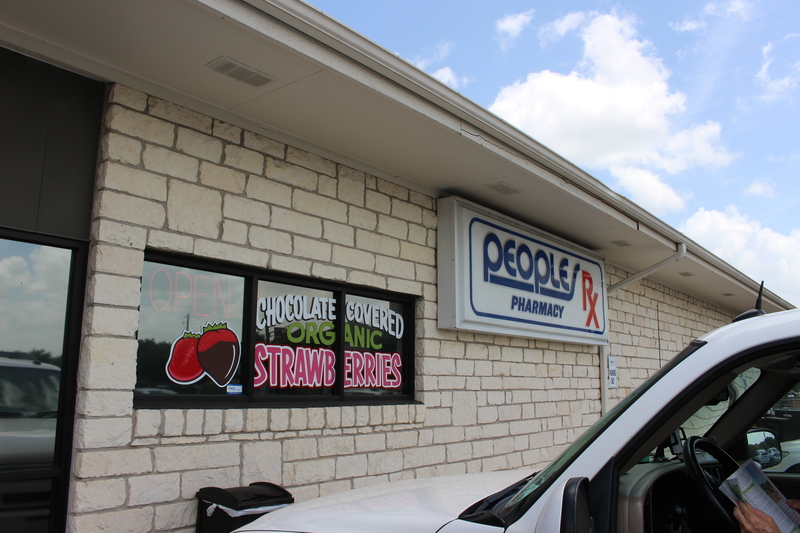 Though People’s Rx is a legitimate pharmacy, complete with every alternative medicine in the book, it also features a full deli counter of sandwiches, salads, smoothies and soups, all made in-house and all far into the healthy side of the spectrum. 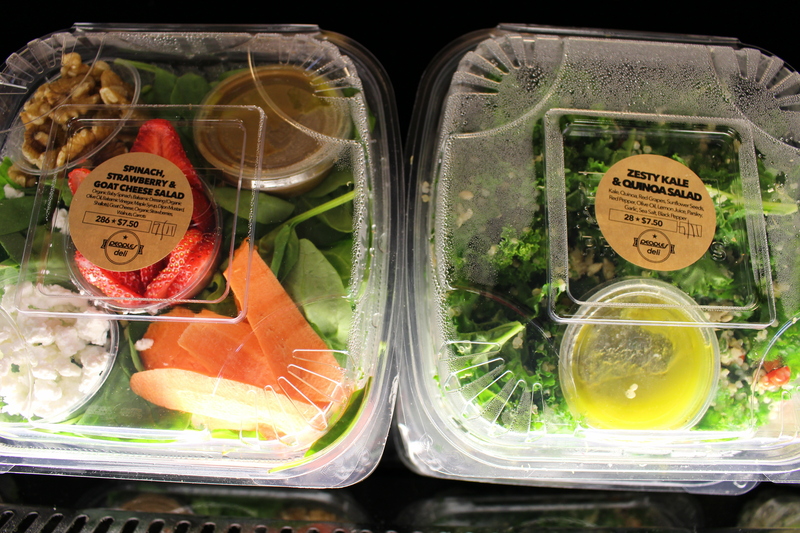 Everything in the display case — and I mean everything — looks fresh, bright and appetizing. The prices are fair ($6.95 for a sandwich, $4-5.99 for sides, $7.50 for smoothies, $3.99 for soup) and the staff was so helpful and friendly to the weird girl with the camera (yours truly) that I would almost go back for the company alone. 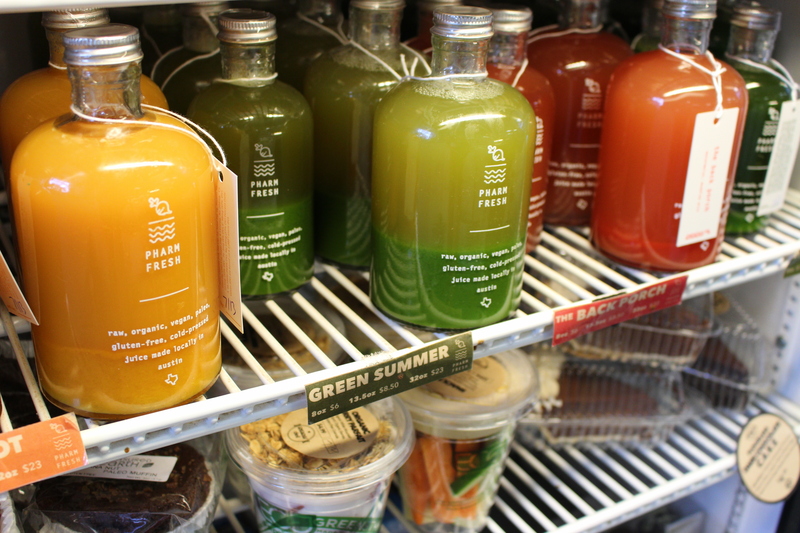 This place is a health-nut’s paradise without being overly healthy. I’ve expressed my disdain for healthy places that sacrifice taste already, almost offended that they assume everyone who walks in there just got back from yoga and is “not eating gluten right now.” People’s is ready for those folks, don’t get me wrong (they make their gluten-free bread in house and even offer a “paleo” option for their sandwiches) but they are also ready for people like me: those who are unafraid of mayonnaise and salt. I dove right into the offerings, standing with my mouth open for about 15 minutes as I stared at the impressive menu board. They had two soups on special today and apparently switch them out daily. 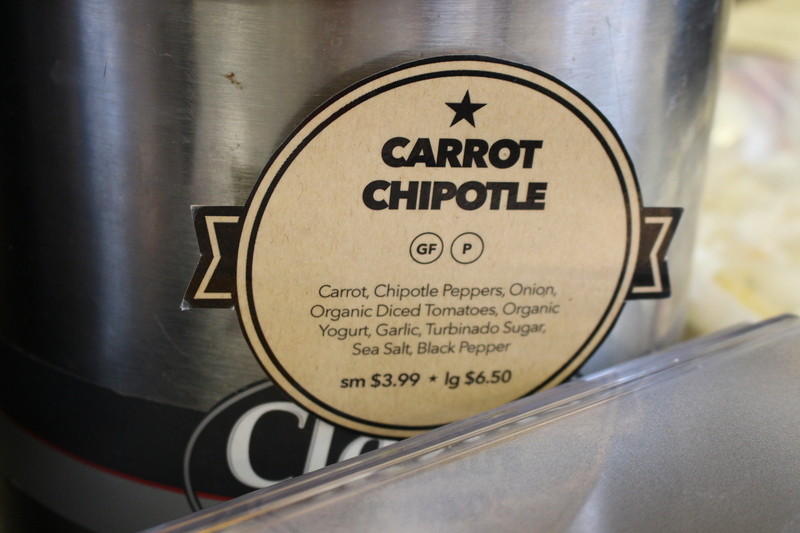 Given the choice between chili on a hot Texas day and carrot-chipotle, I tried a sample of the carrot soup. I think you have to really like carrots to enjoy this one, and the only time I enjoy carrots is when there is nothing else to eat. (I don’t know why I continue to buy them, honestly.) So I opted out of the soup. 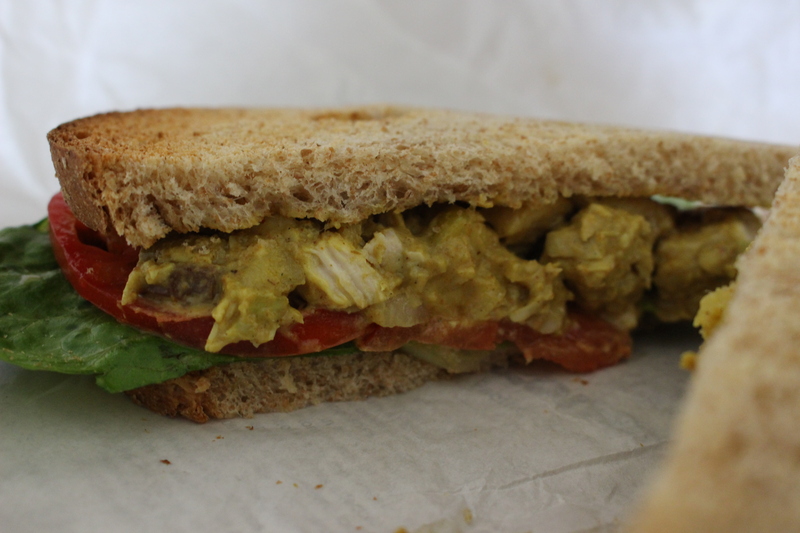 Instead, I chose to have them put their yummy-looking curry chicken salad on some whole wheat bread, order a super-healthy smoothie and call it a day. The sandwich was exactly what I hoped for and expected: SO simple, salted, fresh, made with chicken that had a happy childhood and on a piece of toast that didn’t crumble with every bite. The sandwich was not world-changing or tear-inducing, it was just a sandwich. And with all of their options (turkey + arugula, ham + swiss, B.L.A.T, chicken + sundried tomato) and the $6.95 price tag, I’ll be back. Though I was slightly worried about the smoothie (I’m not a fan of smoothies that taste like grass and the menu didn’t list straight up sugar as an ingredient), I was altogether thrilled with how it turned out. I ordered the Tropical Hydrator, which the helpful guy behind the counter described as “like a Pina Colada.” (Editor’s Note: If you say anything is “like a Pina Colada,” I’m probably on board.) Made with coconut water, coconut, fresh mango, lime juice and cayenne, it didn’t taste like a Pina Colada. It tasted really good in an entirely different way. The lime juice adds tartness and the cayenne leaves that pleasant, subtle burn on the back of your throat with each sip. And I loved the little flakes of coconut. It didn’t make me feel like I was tipsy on a beach; it was more an “OK, world, let’s do this” kind of feeling. 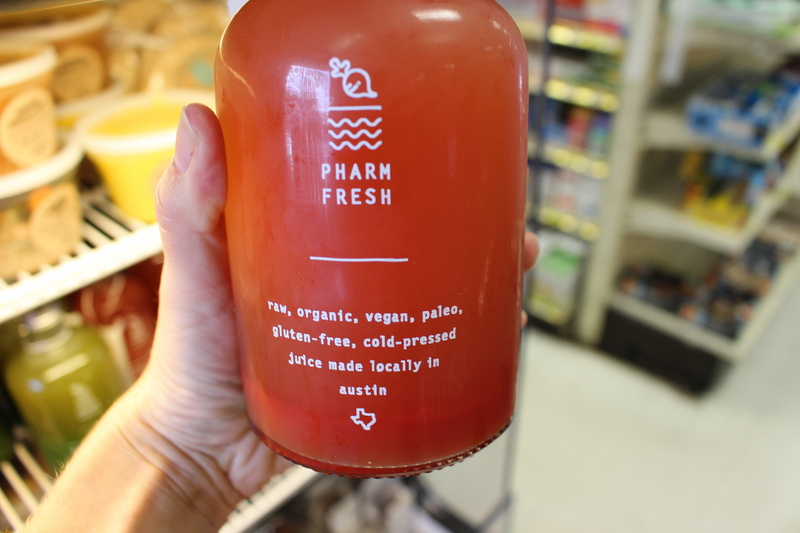 I didn’t opt for the gorgeous, adorable bottles of juice in the fridge, but they definitely made me wish that I was into the cold-pressed thing. I’ve talked in depth in the past about my feelings on juicing, but the cold, $23-bottles of goodness were tempting to say the least. And get this: the South Lamar location is open until 10 p.m on weekdays. That’s brilliant. Late(ish)-night health food needs to be more of a thing. Perhaps the best part of my visit was my chat with a woman sitting in her truck outside. She started the conversation by asking if I was working on a “school project” (bless her heart, that will never get old) and when I explained my involvement in the food blog world, she immediately delved into compliment after compliment about People’s.